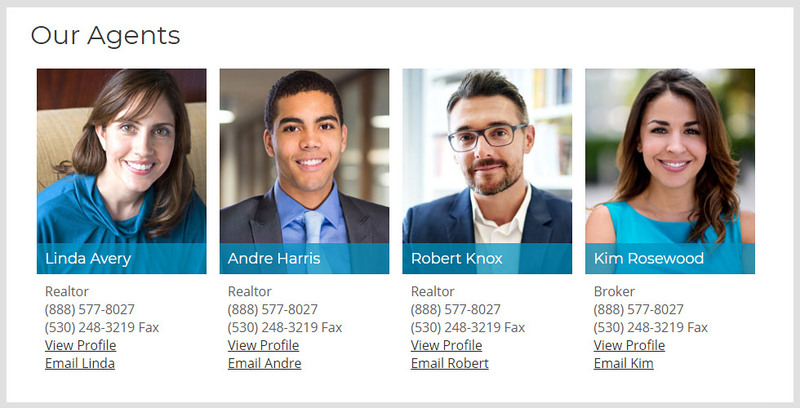 The agent roster will nicely display all Active agents on one page so visitors can quickly find their agent's profile and contact information. Agents will be shown in alphabetical order, show basic contact information and link to a profile page where you can add their bio, website link, phone numbers, email address etc. Simply create a Page for an Agent and they will automatically be added to the Agent Roster page. If an agent changes their phone number, email address, picture, etc. - just update it on the agent's profile page and the Roster updates automatically.